Trevor -- The online community found out about Ed Brubaker moving to Uncanny a couple of days ago…how long have you known he was joining your team and what additions or changes are you looking for with his arrival? Marts -- Ed and I first discussed the possibility of working together on an X-Men project at this past Summers Chicago Wizard Convention. At that point in time it was more of just loose talk about how well Deadly Genesis was doing. I was telling him how I might be interested in doing something after Deadly Genesis was done but we really hadn’t pinpointed Uncanny X-Men at that time. Over the next few months we realized that we wanted to shake things up in 2006. It was a no-brainer when we decided to do something with Uncanny. Ed appeared to want the job and I knew he was the right person for the job. I’m looking forward to the continuation of the flavor he established in Deadly Genesis. When he started that story he let the readers know he knew the characters and their voices. He then proved it by showing he wasn’t afraid to take chances with them. To put these characters in situations that was unexpected and maybe a little bit of a risk. We saw him do that with Banshee and readers will see him do more of it with the villain of the story. His plans for the Uncanny X-Men arc are no different than what he’s been doing in Genesis involving the risks he is willing to take. He is taking it a few steps further. It’s almost like Deadly Genesis was Brubaker’s test drive and now he is going to get out and take the car for a crazy spin. Trevor -- Will there be any new characters joining the Uncanny line-up? 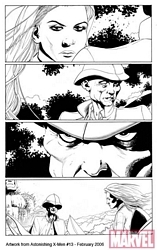 Trevor -- How much of the ramifications of Deadly Genesis will play out in Brubaker’s Uncanny run? 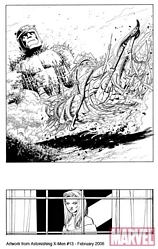 Marts -- The ending of Deadly Genesis will provide the thrust for Brubaker’s run. Thanks to the close relationship between the villain of Deadly Genesis and the X-Men we are in for one great ride! Trevor -- Larroca’s artwork from the previews of Apocalypse’s arc is outstanding. What do you think happened after his move from X-Treme and what caused this drastic switch of style again? Marts – Salvador has always felt confident about his pencils and he wanted to attempt seeing what his art would look like with just his pencils and a certain color approach that started with X-Treme. But just like every Artist, he wants to evolve and change his style. 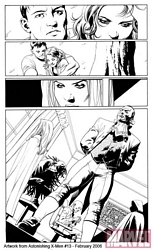 He decided to go back to inking and that’s where the strength of Danny Miki came in and it is making Salvador’s work even better. The technique he is using now is a few steps beyond what he was doing in X-Treme. In X-Treme he dealt with mostly his pencils and Liquid’s coloring. This time around he is using his own pencils and inking on his own but he is also adding some ink-wash techniques to his work. After that is done, Liquid goes in and does an outstanding job. The results we’re getting are great and it’s almost like a 3-D effect. You’re seeing new life in an already great Artist. Trevor -- Can we safely assume that Apocalypse will play a role in the X-Men’s lives even after his story arc is through? Trevor -- What will, if any, be Sinister’s role in Apocalypse’s newest story? Marts -- With Sinister we haven’t worked out anything concrete just yet. I think it is okay to assume that he will be appearing. He has a history with Apocalypse. We’re still looking for the right story angle to approach with Sinister. Trevor -- Tell the fans about the old characters that are being reintroduced or any new characters that you’re adding. What’s Ozymandias deal? Why is he following Apocalypse this time? 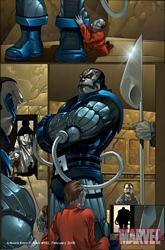 Marts -- He is Apocalypse’s right hand man, whether Apocalypse wants him or not. He is the guy that has chronicled Apocalypse’s history throughout the millennium. He will be appearing in all the issues that Apocalypse’s appears. Some readers will remember that back when they first met there was a lot of animosity between these two. Apocalypse has forced a man that killed his own step-father to work side by side with him throughout the millennium so there is definitely a history between these two. Trevor -- What about Gazer and Torso? What are there roles in Apocalypse’s story? Marts -- With Gazer we have an average mutant without any extreme powers. When he was affected by M-Day instead of losing something glorious and glamorous he lost the very thing that was keeping him alive and helping him do his job. He is about as down and out as a person can get and slowly losing his mind. It’s funny that this kind of person seems to be the type that Apocalypse searches out to make one of his Horsemen, isn’t it? Trevor – hhmmm…. I wonder what you mean by that Mike? Marts – No Comment Trevor – Back on subject…what about Torso? Marts -- Torso is just a figment of Gazer’s imagination. While it is an A.I. unit serving its job as a scientific experiment in space there is no life or even voice to the machine. Trevor -- What about Toad and/or Mammomax? Marts -- Both characters will be appearing regularly throughout the 198 series. Trevor -- Speaking of characters that have just recently “reappeared” why Erg and Peepers? Marts -- As far as Erg we were searching through the Character Glossary on your website. We were searching for someone with a pretty decent power, having a good visual, and someone that has a background that hasn’t been explored in depth much. On the other hand Peepers is an all time favorite of mine. When I really fell in love with him was when Frank Tieri talked me into using Peepers in his Wolverine arc where they were trapped in the prison called the Cage. At that point in time Frank wanted to use this obscure character in a supporting role and I just love the way he wrote him into the story. The way that Frank wrote him was quiet different than the way he was shown before. Trevor -- Pulse is a new character that has only recently appeared in the X-Men comics. What is his story? Why does Mystique want him as a future son-in-law and not Gambit? Marts – Readers will soon learn that the reason Mystique wants him associated with Rogue is that there is something special about his powers that will allow Rogue to experience things that she has seldom experienced in her past. Trevor – Speaking of Mystique…what is up with her now? Will she be joining the X-Men? What do you see as the pros of her becoming an X-Man? Marts – The pros are that she has worked in the government, worked many different sides of the fence, and she has ties to both the bad and the good guys. Her spy network will allow her to get into things that the other X-Men cannot. A few months back she asked for a place on the team and the X-Men gave it to her. She soon thereafter left for other things. The question of her membership will definitely come up a few issues from now. Trevor -- With Chris Claremont leaving Uncanny it seems he will have more time to focus on New Excalibur. Is that one of your goals for this creator change? What were the other factors that led to your decision? Marts -- The one thing about this business is that it is fluid and things change from day to day. We have a big announcement that will be coming out in a few weeks involving another title that Chris Claremont will be taking on. The decision for the change was that it seemed like the right time and the direction that the readers wanted to go. We were so impressed with what Ed has done on Deadly Genesis that it seemed like the new direction to go. Trevor -- Is this new title because of the reader poll that Marvel recently placed on their website? Marts -- No, this title will be completely independent from the reader poll. Trevor -- Will the new line-ups that have been teased about on the internet contain any characters that have never been “officially” labeled as an X-Man? Marts – Yes, most definitely. Trevor -- With the 198 story being told how much of a fine line do you see between Evil Mutants and Heroic Mutants? Will we be seeing more of a shifting of the old villains towards the side of good or do you believe that good and evil are not as blatant as it once was? Marts -- This really boils down to a time of crisis. 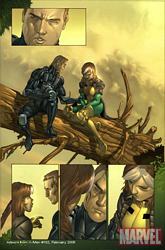 The House of M and Decimation has forced the mutants to stop looking at themselves as good guys and bad guys. For the first time ever the entire mutant race has been forced together to insure their survival. That is something we’re exploring in the 198 series. A lot of disenfranchised mutants and those without homes have been forced into the Xavier Institute. All will not be pretty or go well there. Trevor -- We just spoke to Whedon about Astonishing. Why use the Hellfire Club? Marts – The Hellfire Club has such close ties to the X-Men’s throughout the history. Some of the biggest events in the X-Men’s history, specifically the Dark Phoenix Saga, revolve around the Hellfire Club. This is one of those stories that people will be talking about for years to come. Also there is the obvious Emma Frost connection. 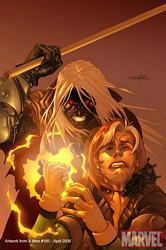 This first arc will explore facets of Emma’s personality that harkens from her days as a member of the Hellfire Club. Trevor -- Can you talk about the hooded character that has been seen with them? Who is he/she? Trevor -- Are you going to show any of Kitty’s reaction to William Stryker’s miraculous resurrection since he is a major Kitty antagonist? Marts -- If we see any of that it will be in the title of New X-Men. Trevor -- Let’s talk about the title that is the future of the X-Men: that of New X-Men. Who is the one person on the team that you see as a future X-Man? Trevor -- Which character is your favorite? Trevor - Out of all the X-Titles New X-Men was hit the hardest with Decimation. What one character do you look back and say, “Man I wish I had kept that one!”, or you thought might have had potential but in the end decided not to keep? Marts – Jubilee. I love the character. The character had tons of potential. She was a true fan favorite. Sadly, I think that is why we decided to de-power her. We realized that when all was said and done we couldn’t just depower just a second rate character, it wouldn’t make the story very effective. I think in the long run it was a smart decision and it helped to drive home the strength and the message of the story. Trevor -- Phoenix: Endsong was, in my mind, a hit. What plans do you have for a future title that involves the same cast? Marts – We were so excited about the success of the story. 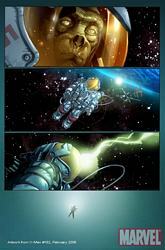 There is defiantly a lot of potential to do more with the concepts that were involved in that story. Trevor -- Can we expect the Stepford Cuckoos to become more developed in the future or have they been put on hold for now? Marts -- There will be important developments for these characters over the next year. Trevor – Cyclops’ character has the opportunity to be shown as the most “powerful” X-Man just like Stan Lee described him in the early beginnings of his run on X-Men. What are your thoughts on the character and can we hope to see more of a Spotlight on him in Astonishing’s upcoming run? Marts -- Cyclops is my favorite X-Men and some of what Joss said in his conference call shows what he has planned for the character. Believe me when I say “Scott will be a major player in Joss’ run of Astonishing X-Men”.